Expect years of lasting value from this table! Its heavy-gauge, tubular steel pedestal legs have a steel strap folding mechanism. You won't have to worry about this table collapsing — its gravity-activated locking ring securely locks legs into place, making collapse impossible. 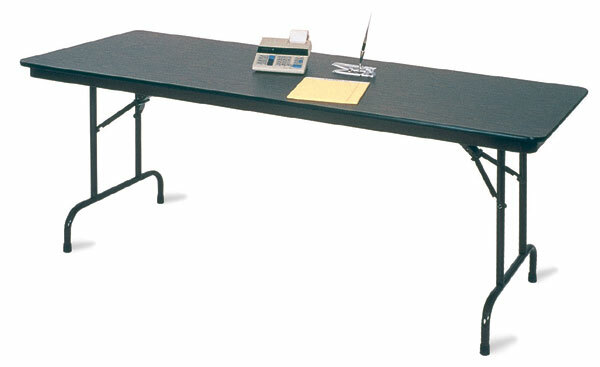 The 29" high table top is made of high-pressure laminate plastic with a solid core, and has a thickness of 11/16" (17 mm). Plastic crutch tips on the feet protect the floor from slipping or marring. The Walnut finish table has a colored top with black trim and walnut colored metal.